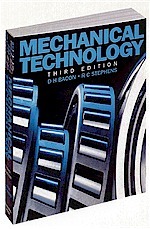 Completely revised to reflect the changing policies of the Business and Technician Education Council (BTEC) for courses leading to Higher National qualifications in mechanical engineering, Mechanical Technology, Third Edition provides full coverage of stress analysis, dynamics, thermodynamics, and fluid mechanics without sacrificing depth of treatment. It is unmatched by any other book in its class, and is a necessary reference for any engineer’s library. Unusually broad coverage for a one-volume reference. Underlying theory is presented concisely with illustrative worked examples and many tutorial examples. Contains an expanded and more developed section on heat transfer and a completely new section on hydraulic machines. Designed to cover a wide range of courses offered by colleges and universities. Preface. Simple stress and strain. Shearing force and bending moment. Bending and shearing stresses. Torsion.Deflection of beams.Struts. Strain energy. Complex stress and strain. Cylinders. Dynamics Velocity and acceleration diagrams. Reciprocating mechanisms. Turning moment diagrams. Balancing of rotating masses. Friction clutches, bearings and belt drives. Gyroscopic motion. Gear trains. Free vibrations. Transverse vibrations and whirling speeds. Damped and forced vibrations. Thermodynamic properties of substances. Basic engineering thermodynamics. Second law of thermodynamics. Steam plant. Gas turbine plant. Reciprocating internal combustion engines. Refrigerators and heat pumps. Reciprocating air compressors. Combustion. Plant performance. Heat transfer. Pressure and pressure measurement. Hydrostatics. Flow and flow measurement. Momentum of fluids. Viscosity. Real fluid flow. Dimensional analysis. Dynamic similarity. Turbomachinery. Centrifugal pumps and reciprocating pumps. Hydraulic devices. Appendix A ¦ Moments of area and inertia.Appendix B ¦ Differential equations. Index.